Dissolve in a test tube one spatula-tipful of potassium cyanide in approx. 1 ml water. Add 2-3 drops of iron(III) chloride solution. A deep, blood-red color results. 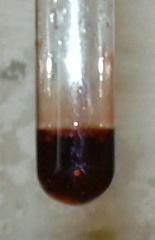 An intense colored iron(III) thiocyanate arises. In this manner one can verify iron(III) as well as thiocyanate. In the case of pure iron(II) there is no coloration.